The new association held a kickoff reception Thursday night at Patry’s DaVinci’s Eatery with dozens of people turning out to hear board Chairman Michael Dostie’s vision. Dostie said the group, which has applied for nonprofit status, wants to promote the downtown as a destination and business opportunity with marketing outreach, a new website and an “adopt-a-spot” beautification project already underway. The effort is separate from the local chamber and targeted to the area between Main Street and Adams Avenue, from Middle Street to the Androscoggin River. “We need to rebuild the business community,” said Dostie, of J. Dostie Jewelers on Lisbon Street. Planning started six months ago. A membership drive began two weeks ago, coordinated by Patry and Carl Sheline of Maple Way Dental, and has already signed up more than 40 members. He mentioned new business activity on Lisbon Street and redevelopment projects such as the Hartley Block; 199 Lisbon St., owned by Patry; and 46 Lisbon St., owned by Kevin Morin and Dianna Pozdniakov. He said that in the past 10 years, more than $100 million has been invested in the downtown commercial district, and that Lewiston can build on the progress. He’s hoping the association can assist the efforts of city staff and elected officials that have already gained some momentum, and possibly create business incubator grants or loans and a downtown tax-increment financing district. Lincoln Jeffers, director of economic and community development, confirmed Dostie’s downtown figures. He said Thursday that, by his count, the investment total is up to $106 million since 2010. The new organization had the support of city councilors Tuesday, including Jim Lysen, who said he hoped the Downtown Lewiston Association can continue for a long time, unlike some past efforts that have fizzled. “Let’s keep this one going,” he said. Dostie said Thursday that the downtown’s problems began in the era when businesses were turning away from downtowns in favor of malls. “It is my understanding that around this time there were several attempts to form and maintain downtown associations, but those efforts simply weren’t able to sustain,” he said. 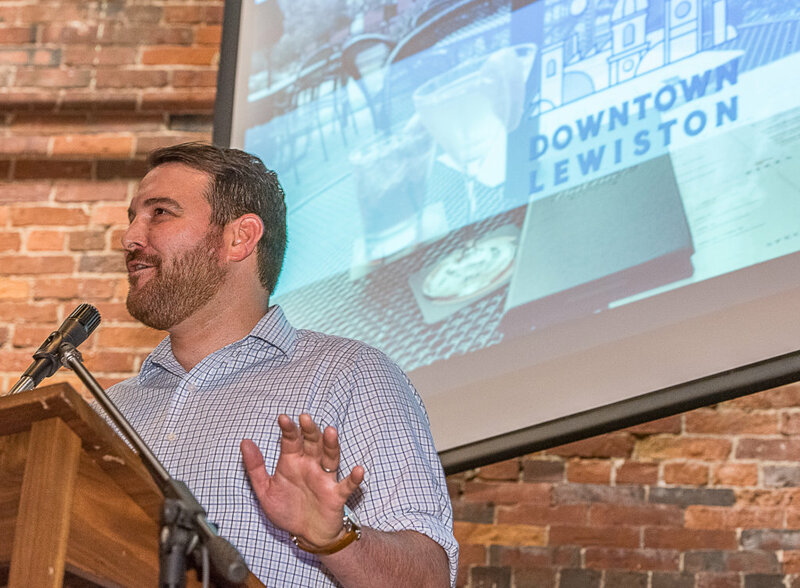 “I believe that downtown Lewiston is ready for a new organization that will help unify our downtown businesses into a stronger community, promote the assets and attractions that we have here, and work with the city to nurture a business-friendly city center,” he said. Jeffers said Thursday that in the past, efforts to rally the downtown were mostly city-run boards or committees. When he started in Lewiston in 2000, he was the staff member on the Downtown Advisory Board, which he said implemented roughly 80 percent of a downtown revitalization plan. Other community efforts resulted in the People’s Downtown Master Plan and a committee to implement it, but that also faded. The concept had a lot of support at Thursday night’s reception. Beckie Conrad, president of the Lewiston Auburn Metropolitan Chamber of Commerce, said the chamber has a large, regional approach whereas a group like this can be more focused. The chamber has become a member of the Downtown Lewiston Association, and the association has joined the chamber, Conrad said. Longtime business owner Jim Wellehan, whose family ran a shoe store in downtown Lewiston for more than 80 years, said it’s a wonderful idea that’s needed. He’s leased the former shoe store building to The Curio, an art and alehouse opening later this summer.